At the Cassowary Coast Regional Council meeting on 29 October 2012 the Cowley Beach to Liverpool Creek dune track was discussed. This dune track is Council’s strategy for dealing with the large number of illegal drivers (both quad and 4WDs) which drive up and down Cowley Beach to the Spit. We have reported in previous Ecotone editions about the devastating effect this driving has had on turtle nesting sites and migrating birds. This process of finalising the track alignment has been ongoing since it was resolved in December 2009 to re-open the area to vehicle traffic in an environmentally sensitive manner. At the meeting Councillors voted that the track section in front of the kitchen barbeque area of Cowley Beach Caravan Park (a 20m section of the track) would be relocated seaward by approximately 5m to re-enter the track butting the caravan park boundary. This decision came to Council as a result of pressure from some local residents who would like to see the track go even further east. However, this will impact on a culturally significant site to the Mandubarra Traditional Owners as well as EPBC listed critically endangered littoral forest communities. The caravan park owners are concerned about the track being noisy and dusty near their camp kitchen facilities which are apparently very close to the boundary of their property. This decision will ensure that the track is another 5m further east of the kitchen, and protected by a timber railing. Local residents have continued to state their opposition to this track, and have threatened to drive illegally on the beach rather than support this compromise position. Mayor Bill Shannon spoke at the Council meeting about the history of the track while Councillor Mark Nolan spoke passionately about respecting cultural sites, and the environmental issues surrounding the Cowley Track. Councillor Ian Rule asked if this track realignment was acceptable to the Mandubarra Clan, which a council officer advised it was. The only discussion on the issue at the Council meeting came from Councillor Glenn Raleigh who is on the Local Marine Advisory Committee and is responsible for overseeing the Environmental Services and Waste portfolio. Raleighstated forcefully, that in his opinion vehicles should not be allowed on the Cowley spit. He stated that this was an area that was subject to storm surge and that vehicles were causing damage to the Spit. He voted against the motion along with Councillors Macdonald and Farinelli. However, the motion was passed with the Mayor making a casting vote. Local activist Russell Constable has sought clarification from Council as to whether the caravan park buildings that the track is being diverted for are indeed lawfully constructed dwellings that have council permits. He believes evidence suggests that this is indeed not the case and if that is so why is Council diverting a lawful road around buildings that are not lawful (and probably not built to code)? To date the Council has offered no clarification on this point. 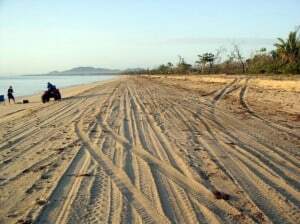 Within the Council meeting, no discussion was made about keeping vehicles off the beach or maintenance to the Cowley Spit road or enforcement of conditions for quad bikes.